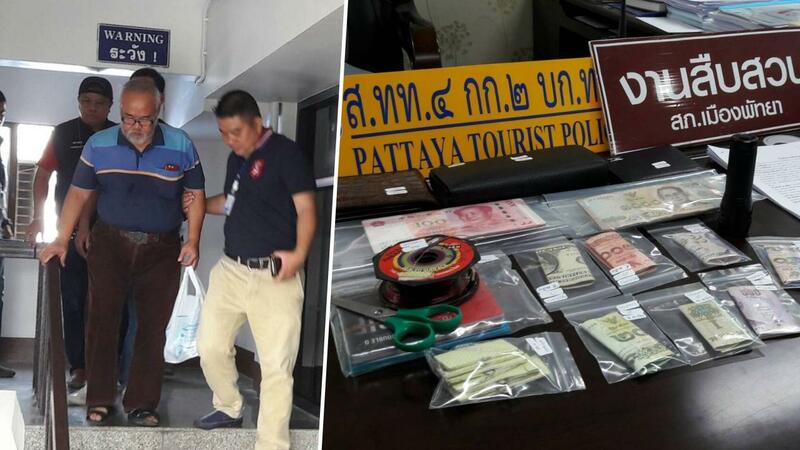 Pattaya police yesterday announced the arrest of a garage owner from Satun in the south of Thailand who they say has been stealing from tourists at many hotels. Thai Rath reported that 60 year Seksan Traisikkha appears to be a respectable gentleman but is really a common thief. Local cops and tourist police led by Pattaya station chief Apichai Krobpetch have been interviewing the suspect who denies everything. He was found in possession of 34,000 baht in Thai and foreign currency. There was an arrest warrant out for him from a previous case in Surat Thani and the Pattaya cops said that the suspect was convicted of theft in Hat Yai in 2012 when current tourist police deputy commissioner Surachet Hakpal was the chief there. That case involved theft from a hotel room, too. Seksan has been initially charged with stealing from the room of a Russian tourist in the Jomtien area. Piyapong Ensarn of the Pattaya Tourist police said they have CCTV evidence that points to the suspect and believe that he is responsible for many thefts from the rooms of tourists. good job BIB. Well done ... !! I can't believe my eyes. There must be an ulterior motive behind this performance of their job. We knew that. What ulterior motive? Wondering where his garage is located so I never take my car there for service. Life is so strange maybe he is a good mechanic and never stole any of his own customers, who knows? All I can say is good job!